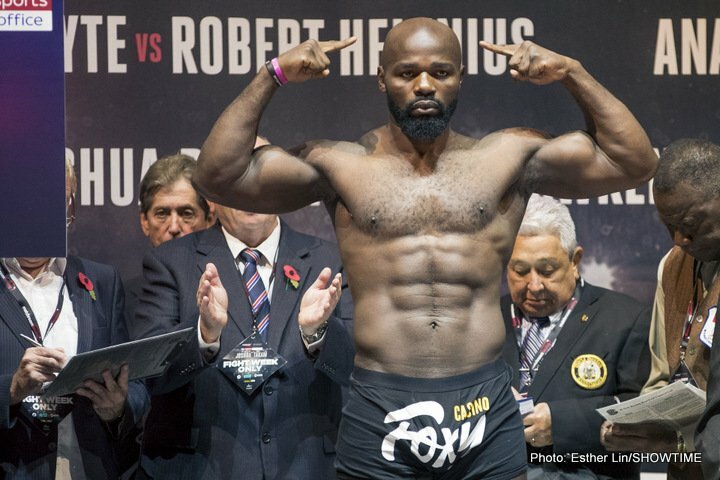 Carlos Takam made a big name for himself in the UK with his spirited, better than expected (and short-notice) battle with Anthony Joshua last year. Now the Cameroonian warrior is set to return to action against TBA in April and after that he wants another big fight in Great Britain – ideally one against Dillian Whyte. Takam, one tough, tough man, is also ultra-experienced (he knows all the tricks of the trade and he sure gave both AJ and WBO champ Joseph Parker a tough time of things) and he always gives fans value for money. One of the only men to have battled both AJ and Parker – who of course meet in a three-belt unification clash next month in Cardiff – Takam (who fought Parker in a non-title bout before the New Zealand man became WBO ruler) has a valued opinion on what will happen when the two unbeatens meet. Joshua seemed to come dangerously close to running out of gas against Takam, while Parker remained energetic throughout his 12-rounder with the Frenchman. If AJ carries as much muscle as he did against Takam, Team-Parker feel the big Brit will come unstuck. And if Takam is correct (and he should know) about the smaller man being that much faster, then Joshua could be in trouble come March 31. As for Takam against Dillian Whyte, that one would certainly be very interesting. First though, Whyte has a potentially tough task ahead of him in the form of a very motivated Lucas Browne. Deontay Wilder aside, all the big heavyweight fights do seem to be taking place on British shores.